Sony has just unveiled its new, improved line of e-readers to compete with the market leaders Kindle and Nook. You can now get the devices sans the deal with the content provider, unlike the ones from Amazon and Barnes & Noble. Reader Pocket Edition / PRS-350 ($179) The new Pocket Edition reader or the PRS-350 is available in a much smaller and lighter design (5.7 x 4.1 x 0.3 inches) while retaining its 5-inch display. 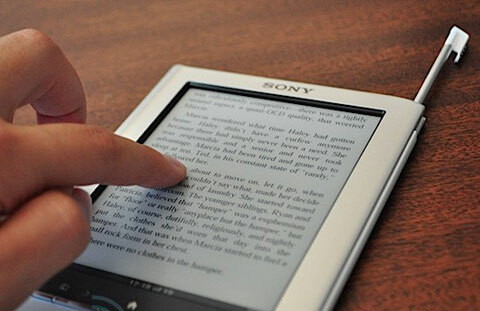 Sony explains that the reader now features its own enhanced touch technology, E Ink Pearl, which doesn’t blur the E Ink panel. The print quality and page turns are now a whole new snazzy experience. There’s still no WiFi or 3G here, but the $179 e-reader now has 2GB of memory, an SD card slot, a USB connection and support for EPUB/ACS4, PDF, Microsoft Word, and other text file formats. It’s available in Pink and Silver. Reader Touch Edition / PRS-650 ($229) This model was previously the only one featuring touchscreen technology and hence was called the ‘Touch’. Now all 3 models have this technology so Sony should change the name of this model. The new ‘Touch’ weighs only .4 pounds and also has faster and more responsive page turns and enhanced touchscreen capabilities. Like the Pocket model, it also has 2GB of onboard storage along with SD card and MemoryStick Pro slots. This one comes in black and red. Reader Daily Edition / PRS-950 ($299) The Daily Edition reader costs a little more than your average e-reader but it’s the price you have to pay for advanced touch technology and very slim hardware. With faster page turns like its other 2 siblings, it weighs .5 pounds and features a new simple browser that works only over WiFi. Needless to say, the PRS-950 has WiFi connectivity. It also boasts of 4GB of memory and increased battery life (27 days with the wireless turned off, Sony claims).It’ll be available on shelves in November.